"The Close of a Chapter: Live in Quebec City"
SUFFOCATION represents death metal's mighty roar; everything from Frank Mullen's patented microphone-eating growl to the thick/dry/palm-muted riffs, to the impossibly heavy rhythm section all scream "brutal death!" 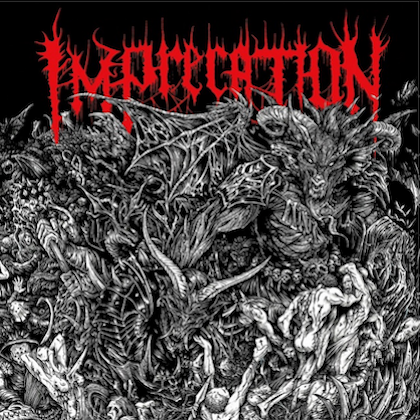 While clearly evident on the studio recordings, even with a history of uneven productions (save for the last couple of albums), it is the live environment where SUFFOCATION has made a name for itself. Almost across the board, those that have witnessed the New Yorkers on stage have come away with brain matter leaking from the ear canals. 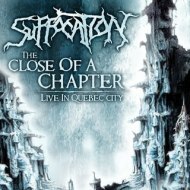 "The Close of a Chapter: Live in Quebec City" expertly captures the SUFFOCATION live experience, as well as offering new listeners a career retrospective of sorts. As live albums go, "The Close of a Chapter" is one of the more entertaining ones I've heard, as well as sounding genuinely live, thanks to a performance that is "raw and unedited." The SUFFOCATION/Joe Cincotta recording of the 2005 performance is of good quality; the sound is fierce and pummeling with good instrument separation. For example, it is great to hear Derek Boyer's bass in the mix, as his low-end duties coupled with Mike Smith's monstrous drumming is paramount to the SUFFOCATION delivery. 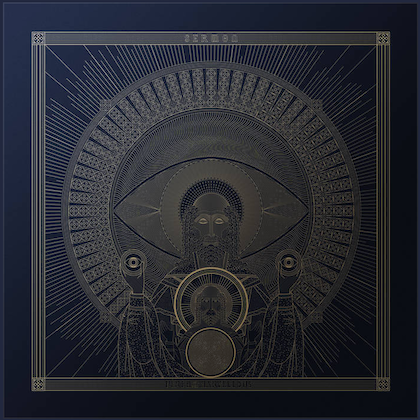 It probably doesn't need to be stated, but I'll state it anyway; the riffing/solos from Terrance Hobbs and Guy Marchais sound fantastic. In fact, the band as a whole is locked down tight across the entire 64-minute performance. Mullen's between-song banter is always highly energetic and at times downright comedic; you'll be repeating his phrases in faux New York accent, as SUFFOCATION fans are prone to do after an evening spent with the destroyers. With a set list running the gamut from the ancient ("Catatonia") to the classic ("Pierced from Within" and "Effigy of the Forgotten") to more recent material ("Surgery of Impalement"), "The Close of a Chapter: Live in Quebec City" is a must-buy for fans and a great starting point for new members of the Church.